Ketra lighting technology was born from the idea that the best light comes from nature. Ketra light fixtures and bulbs and its corresponding control systems are tunable to cover the full RGB spectrum and white hues, dynamically shifting throughout the day to match the color temperature and intensity of natural light as you experience it outside. Its tunable power enables homeowners to bring the health benefits of natural light indoors, creating a more pleasant, soothing, and healthy environment no matter the time of day. Now acquired by Lutron, a world leader in smart lighting control, Ketra complements Lutron’s range of services for homeowners everywhere and rounds out Lutron’s most comprehensive portfolio of lighting control solutions in the industry. The average American spends more than 90 percent of their time indoors, according to the Environmental Protection Agency. Our lack of time outdoors is disrupting our body’s circadian rhythm, which can negatively affect our sleeping patterns and overall energy levels. Simulated natural light is a profound solution to help regulate your internal clock even while you’re indoors. Using LED light to imitate natural light patterns can help our bodies produce the right hormones at the right time, ultimately aiding in better sleep and more energy throughout the day. 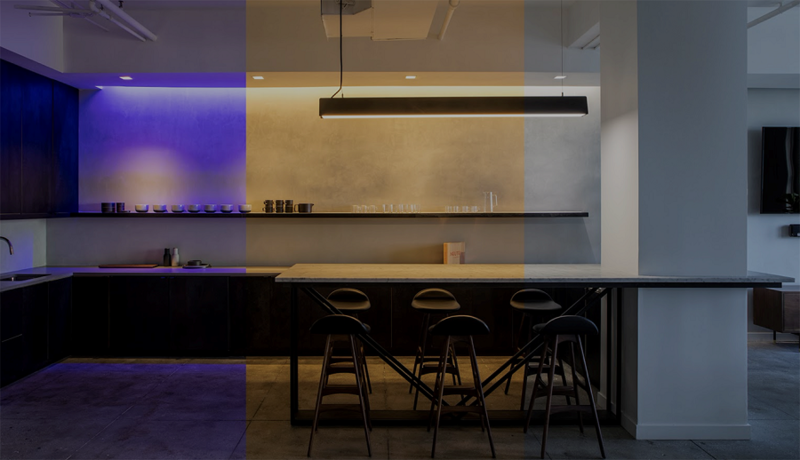 What’s more, Ketra tunable lighting lets you design your home spaces with an unlimited palette of white, color, and pastel lighting. You can fine-tune vibrancy at will with dimming so comprehensive that it can even simulate a candle’s flame. No matter the occasion, Ketra lighting can perfectly set the tone. With Lutron’s luxury HomeWorks QS home control system, you now have the power to control Ketra lighting and custom scenes from a wide selection of beautiful interfaces offered by Lutron. Program Ketra lighting scenes such as Energize, Relax, Entertain, and Natural to fit every time of day, and even control your light by voice with Google Home, Amazon Echo, Apple HomeKit, and more. With HomeWorks QS, you have unparalleled total home control. HomeWorks QS seamlessly integrates the control of your Ketra lighting with your A/V, security, and HVAC systems for full personalization and command over your spaces. With Ketra tunable lighting and Lutron’s HomeWorks QS control system, you’re truly investing in smart technology that will redefine how you live your life — for the better. Ready to experience this breakthrough duo of Ketra fixtures and Lutron lighting control for yourself? Our team at Wipliance can help you get started – whether you live in the Bellevue area or in Arizona. Schedule a free consultation with us right now or send us a live chat below! We look forward to hearing from you!